"Super-sized" chocolate bars are to be banished from hospital shops, canteens and vending machines, NHS England says. Sweets and chocolate sold in hospitals should be 250 calories or under, the head of the body says. Under the plans, most "grab bags" will be banned - with hospitals given a cash boost for facilitating the change. The proposals would also see 75% of pre-packed sandwiches coming in at under 400 calories. Pre-packed savoury meals and sandwiches must also contain no more than 5g of saturated fat per 100g. And 80% of the drinks stocked must have less than 5g of added sugar per 100ml. In April, NHS England said it would ban sugary drinks if hospital outlets did not cut down on the number they sell. Simon Stevens said the NHS was "stepping up" to combat an issue that was causing "an epidemic of obesity, preventable diabetes, tooth decay, heart disease and cancer". NHS staff are also being targeted as part of the move to tackle unhealthy eating, including those on overnight shifts. It is estimated that nearly 700,000 of the NHS's 1.3million staff are overweight or obese. NHS premises have huge footfall from the communities they serve, with one million patients every 24 hours. The Royal Voluntary Service, the biggest hospital retailer across the UK, said it had already begun introducing healthier choices and had seen fruit sales go up by a quarter. Public Health England says hospitals have an "important role" in addressing obesity and not just dealing with the consequences. Campaigners says more action is till needed. Helen Dickens from Diabetes UK said: "We look forward to seeing more information on how it will work in practice. "However this is just one piece of the puzzle when it comes to tackling obesity. We need to go much further, which is why we are also calling for the Government to toughen restrictions on junk food marketing to children, end price promotions on unhealthy foods and introduce mandatory front of pack food labelling." 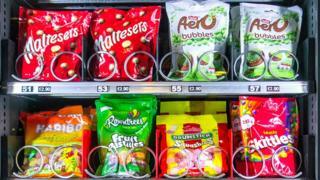 A Welsh Government spokesperson said: "We restricted the sale of chocolate bars and other sugary products from vending machines in Welsh hospitals nine years ago. We're pleased NHS England is now looking to follow our lead."